Have You Considered Having Your Bags Printed? XXS Black Cotton Drawstring Bags Sold per pack 10 100x150mm Dyed black cot.. 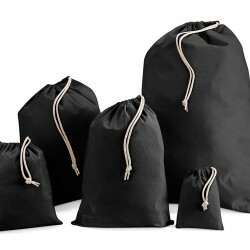 Extra Small Black Cotton Drawstring Bags Sold per pack 10 140x200mm Dye..
Small Black Cotton Drawstring Bags Sold per pack 10 250x300mm Dyed blac..
Black Cotton Drawstring Bags Sold per pack 10 300x450mm Dyed black cott..
Large Black Cotton Drawstring Bags Sold per pack 10 400x500mm Dyed blac.. Extra Large Black Cotton Drawstring Bags Sold per pack 10 500x750mm Dye..